Choosing Canada Junk Removal is as easy as having our professional staff remove your junk. It takes 4 simple steps from start to finish! At Canada Junk Removal, we provide good old fashion hard work and offer demolition services to help our customers with bigger removal projects. Canada Junk provides residential and commercial cleaning services. Our professional cleaners provide high quality and affordable cleaning services. Canada Junk offers free, no-obligation proposals to provide waste collection and removal services for your special event. Whether you are planning a large or small, indoors or outdoors event, we can provide your waste solutions. Our friendly, clean-cut teams will arrive promptly on site, work efficiently, and haul your hoarding stresses away quickly. In a very short time, we will retrieve, sort, load, haul, and donate or recycle every last item that needs to go. From huge office cleanups at large corporations to regular garbage pickup for property managers, we offer professional, friendly service for all your commercial needs. Flexible invoicing terms & volume pricing structures. Why you should choose Canada Junk? Want to finally get rid of that junk? We look forward to the opportunity of working with you. We know our work is done when we hear the guaranteed satisfaction from our clients: “I finally got rid of that junk!”. Canada Junk offers the best junk removal and the friendliest service in the Greater Toronto Area. We only charge for the space your items take up in our truck, you'll be able to see everything for yourself. No matter the circumstances, we guarantee professional service for any job. Most people have, at some point, found themselves stuck in this predicament: they take a look around their property and become amazed to find how much stuff they have–much of which are either unwanted or space-consuming. If this sounds like something you’re struggling with, we understand the overwhelming feeling of clutter; at times it can feel impossible to wipe the slate clean. At Canada Junk, we make it our business to help out those who are too overwhelmed to tackle the project alone–or are simply physically unable to do so. We believe in everyone’s dream of having the clean and beautiful space to live in, and that’s why we make it our mission to make it your reality . 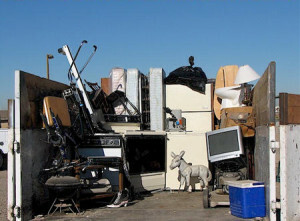 With our junk removal services, you can expect a professional but affordable job well done. Our experienced team at Canada Junk will show up to any location in or around the Greater Toronto Area (GTA); our junk removal specialists in Toronto are prepared to remove all trash from your property quickly and thoroughly. Whether it’s a whole lot of old newspapers or scrap wood, we can help you out with properly disposing of the junk. Canada Junk is a locally owned and operated Toronto junk disposal and recycling company. We proudly specialize in commercial, construction, and residential pickups throughout the GTA. Pick ups are simple; we look over the junk with you and create a price estimate. For added peace of mind, all prices are shown before the job begins. In addition to basic trash removal services we are also equipped to provide furniture removal and even piano removal. Whether you have a large collection or small, our capable representatives and well-serviced vehicles are up to the task. On top of that, trust that your experience with us will always be speedy, professional, and friendly. The Canada Junk advantage lies in the fact that we charge by volume, not by weight. This makes our pricing much more accurate than our competitors, and is—above all—more fair to you, the customer! Further, as active members in the community, we at Canada Junk are committed to keeping our cities clean, green, and beautiful. Through our work, we hope to improve our community one project at a time. We thoroughly screen through all materials to ensure that recyclable items are salvaged and delivered to the appropriate recycling channels and depots. Anything in great shape will also be donated to local charities so you know everything is getting their full use. Why should I use a junk removal service instead of letting the weekly waste management city service pick up my junk? What do I need to do ahead of time before you come to get my junk? How much junk is too much junk? What if my junk isn’t really “junk”? Can you help me donate it? What about tricky items? Can you remove my hot tub? Do I have to be there when you come to take the junk away? Where do you take my junk? What if I simply want you to relocate it for me? I just bought a house that needs some demo. Do you do that? My home is overflowing, but it’s too much work for me to do by myself. Can you help? All of my junk needs to go! Every last bit of it. Can you take it all?